The Ladbrokes variety of most popular sites are joined up in the app version, and this includes Bingo and Games. Along the bottom of the page, players can quickly select between Bingo and Casino Slot Games. The app design is easy to navigate, having its most essential features derived from the main website. Page loading is therefore quick, making gameplay much more enjoyable. Ladbrokes Android App is free to download and use, albeit outside of the Google Play Store. Step 2: Ensure that the “Unknown sources” box is ticked (remember to only allow installations from trusted developers). Step 3: Uninstall any old Ladbrokes App before downloading Ladbrokes Bingo. Step 4: On mobile browser, go to mobile.ladbrokes.com. Step 5: Tap on “Bingo” tab from the left-hand side menu. Step 6: Tap “Bingo App”. Step 7: Tap “DOWNLOAD NOW”. Step 8: Access the downloaded app by going to the Download folder. Step 9: Tap on the file “LadbrokesBingo.apk” to install. Tap “Install” to confirm. Step 10: Locate the Ladbrokes Bingo App icon in the apps menu, and tap to launch app. Step 11: From the bottom menu, tap “Bingo” for a range of Bingo types, or tap “Games” for a selection of Casino Games. Enjoy playing! Like its Android sister, the Ladbrokes App version for iPhone and iPad is simply-designed with an easy-to-navigate interface. The app is free to download from iTunes or the App Store. Bingo and Games are consolidated in one app, yet making selection from the wide range of offerings easy to find. App icons are easy on the eyes, and branding is distinct, making players keep that familiar feel of playing on the main website. Game graphics are also gorgeous and catchy, putting a lot of fun into the gaming experience. There are more Ladbrokes standalone apps available on the App Store such as Bingo, Casino, Games, Live Casino, Poker, Lotto, Sports Betting, and The Grid. This is unlike the limited selection of apps available for Android and Windows Mobile. Players would be looking forward to an expanded gaming experience when Ladbrokes turns out new updates next time. Step 3:Tap “GET APP” to download and install app from the App Store. The Windows Phone variant of the Ladbrokes App features the Sportsbook, which enables players to place bets anytime, anywhere. Its interface is as simple, slick, and easy to get around as its Android and iOS cousins. Log-in is as well, automatic. Players can personalise their own homepage for quick viewing. Betting is a breeze with its easy-to-use “Betslip”, and single quick bets can be placed via “Quickbet”. 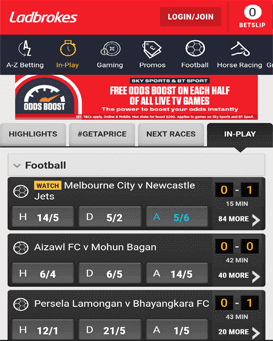 In-play scoreboards and a wide range of football coupons make tracking matches easy and enjoyable. As with the Ladbrokes family of apps, deposits and withdrawals are made securely. First-time users can register through the Sportsbook App and receive a £50 Free Bet joining bonus. Step 1: Search for “Ladbrokes Sports App.” on the Windows Store. Step 2: Tap “Get” to download and install app. The Ladbrokes Mobile Site offers the essential pages and functions from the Ladbrokes main website. It makes it convenient for users to play on their mobile devices quickly, especially when some players would opt not to install apps on their devices. The mobile site mirrors the detail and simplicity of the Ladbrokes main website. Clear menus, small icons, and distinct branding gives players a feeling of familiarity with, and trust in their favourite bookmaker. The general usability of the Ladbrokes Mobile Site is excellent. The high quality of the in-game graphics throughout the site really make the playing experience lively. Being a trusted name in the gambling industry, Ladbrokes knows the value of good customer service. The mobile site, like the main website, provides access to a wide range of support options served by live chat, telephone and email for 24 hours a day, seven days a week. The security on the site is constructed to industry-recognised encryption standards. Depositing and withdrawing money is also highly secure. The mobile site offers a wider selection of payment options than other mobile sites. On the Bingo page, there are useful resources that give a run-through of the latest promotions, reward systems, and more. Bingo features gaming rooms and multi-player options. All new players are can receive a £30 Bingo Bonus, and an extra Slot Bonus worth £10 upon depositing and spending £10 on tickets in most gaming rooms except Joker Jackpot and Cash Bingo instant game. There are a variety of 90-ball and 75-ball games, but there are also a great number of variants to try, too. The different options give one the chance to try branded games like “Deal or No Deal”. There is a whole section of the site dedicated to these types of games that give a different experience from the common bingo game. There are movie-themed games that players can also enjoy, like the “Who Wants to be a Millionaire?” Bingo game. Multiplayer bingos are also offered. These give a smaller, more intimate setting for just a few players per game. The Multiplayer games are based mainly on a ladder set up, where one can climb higher to earn more jackpots. Networked games like Bingo Linx have jackpots every day and are popular with the players. The Bingo lobby is always busy, and all the games for a full week are posted in advance. Be warned, though – game rooms can be bustling. That makes pre-buying for jackpot games an essential move to enjoy Ladbrokes Bingo. For experienced Casino players adept at Roulette or Blackjack, there are many networked tournaments that Ladbrokes hosts online. In the Live Casino, there are the choices of Baccarat, Roulette and Blackjack all served up by the friendly and impressive Live Dealers. There is also the ultra-quick and exciting Automatic Slingshot Dealer that has an instant chat feature so one can talk to other players and get to know who the opponents in the game are, helping one create a personalised strategy of whom to avoid, and whom to challenge. On a more professional casino level, Ladbrokes offers Vegas Style Casino. Serious gamblers go to the VIP Club. The stakes here are higher, and the level of the competitors is more professional. Ladbrokes offers a Free Play option that gives players the chance to hone their skills. Becoming very familiar with the games is very important before deciding to play with real money. The Casino offers more than 500 games for players of all levels and interest. With Ladbrokes Casino created with everyone in mind, there are regular generous promotions for new and existing players. Playing is made more exciting with a variety of eye-catching graphics. There are frequent bonuses offered, and these can be found on the Promotions page. VIP members are continuously being rewarded with VIP points, events and promotions to make the playing experience more fun. Simplified, secure Login that makes it convenient for players to log into Ladbrokes on multiple devices. Secure user account section that make it safe for players to conduct deposit and withdrawal transactions. Separate sections for Bingo, Casino, and in the case of the Windows version, Sports betting. This makes for an undistracted gaming experience. Every customer has access to different Ladbrookes bonus offers which are available in the full website version. One of the best offers is reserved for new customers. Everyone has a chance to claim a £20 bonus in free bets. The bonus is related to your first deposit and bet on Ladbrokes. The minimum amount of deposit is £5, and when you make the deposit, you should bet at least £5 on sports with odds of minimum 1.50 to qualify for the bonus. To access this bonus, you should use a promo code 20FREE. You must enter it on the registration page when you create your account. The bonus is given on 4 parts x £5, which you can use in 4 days after receiving. Ladbrokes App supports Froyo, Gingerbread, Honeycomb, Ice Cream Sandwich, Jelly Bean, and KitKat. You can run it on devices such as Google Nexus 4; HTC One Max; HTC Golf; HTC One S; HTC One X; HTC One Mini; HTC One M8; HTC DROID DNA; Huawei Ascend; LG Optimus F3 P659; Motorola Moto E; Samsung Galaxy S6; Sony Xperia E1; and more. The app currently supports all existing iOS. It can run in devices like Apple iPhone 5S; Apple iPhone 4S; Apple iPad Mini; Apple iPad Air; Apple iPhone 6; Apple iPhone 6 Plus; Apple iPod Touch 4; and more. It supports Windows Mobile that run on devices like Nokia Lumia 620, 920, and 928. If you are unsure whether the app can work with your phone, you can call the support team. Ladbrokes is one of the most established names in the gambling industry. A trusted name since 1886, Britain’s biggest bookmaker grew the business from high street betting shops into the digital age. Being one of the first to venture into online betting, Ladbrokes has come up with easy ways for players to access their instant play site and mobile apps while on the go. All of Ladbrokes offerings featured in their main website are present in their instant play mobile website. For players who follow specific favourites, Ladbrokes has come up with standalone apps for its Bingo and Casino games. A single login and registration are needed to access both the mobile site and the standalone apps. Ladbrokes apps are available on Android, iOS, and Windows devices. Now, on to see what makes each tick. Do I have to create separate logins for Ladbrokes Apps on the web and on mobile? No. The same log-in credentials are needed to log into Ladbrokes Apps on the web and on mobile. Could I set a limit on the funds I deposit? Yes. The Maximum Deposit Limit facility enables one to limit the amount of money one can deposit into an account on either a 24-hour, weekly, or monthly basis. Deposit limits may be reduced at any time, but any increase will only be implemented after a waiting period of 24 hours and confirm the requested change. To change deposit limits, tap on “My Account” and then on the “Responsible Gambling” tab. How do I withdraw through the App? If you want to withdraw funds, log into your account and tap the “Account” icon on the left-hand side of the screen. Then, tap “Withdraw”. You will be redirected to a page that allows you to withdraw funds into your registered card. Are there charges for withdrawing funds? No, Ladbrokes does not charge for withdrawing funds. Yes. All transactions on Ladbrokes are 100% secure. Can Ladbrokes Apps be used while abroad? Yes. The Ladbrokes Apps can be accessed and used abroad anywhere network coverage allows. However, territorial restrictions may apply where betting with Ladbrokes is not permitted, for example, in the USA and its territories. How much will it cost to use the mobile service abroad? The cost to use this mobile service abroad will depend on network operator charges and roaming fees when using any mobile services elsewhere. Network providers would be able to provide more information on roaming charges. Yes. Ladbrokes has gaming customer support on live chat through the apps or website, on phone (in UK 0800 032 1133; outside UK +350 200 43003), and via email at care@ladbrokescasino.com. The family of Ladbrokes Mobile Apps are simple and very easy to use, app loading is fast and enhances the overall experience of playing. While the Windows app is yet to catch up with its Android and iOS cousins in terms of a range of offerings, the game experience is very consistent across apps. The rich selection of conventional and networked games makes it effortless for players to pick out game favourites, and enticing to try out new games. The simple and easy-to-remember interface makes for players come back for more action. With all transactions and personal information well secured, it’s reassuring that this recognised casino is highly regulated for fairness by the British Gambling Commission. For both newbies to online casinos and betting, and experienced players, the Ladbrokes Apps are a great step to enjoy – with a range of deposit options, players can easily fund secure accounts and get ready to play. Couple that with regular game bonuses and promotions, playing mobile on Ladbrokes is well worth it. Overall rating is 9 out of 10. I don’t get how so many companies are creating simple and boring apps like these and still profiting. There are a million apps out there just like this one so how can they be making any money that is worth all the effort into the app. I didn’t realize anyone needed such an extensive step-by-step guide of how to download the Ladbrokes app. It’s not hard. I love this app so much! I used to use another app that was just like this but they seemed to always have bug issues when new updates of IOS came out. This one never has that problem so I switched over. I’m so glad ladbrokes combined all of their great games into one easy to use app! Makes my phone storage happy, haha.